The recent history of the land that I currently live on is that there used to be a big old wood construction southern plantation home that caught fire in the early '80s. There wasn't enough insurance money to rebuild the home to its original splendor, so the former owners sold the 0.75 acres to a developer who divided up the property into 5 lots with a home on each lot. At the time when the developer came in, the neighbors in their 1944 stone home (sort of arts and crafts style home) were sick to have 5 bad 1980s construction homes go up next door. They eventually got used to the homes instead of the lovely plantation home, and became friends with the neighbors. 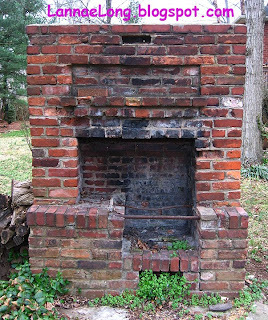 There was one unusual thing in between the 1944 stone home and the former plantation home property, and it was the brick grill that was said to have been shared by the 2 properties. As we were considering moving into one of the bad 1980's constructed homes, the outgoing residents said that they had Sunday dinner potlucks around that grill with all the neighbors, and it was kind of a stress relief fun thing to do before the new work week started. The outgoing residents were saying how much they were going to miss the neighbors, and how awesome each neighbor was. As we were being told that, some neighbor's kids went rolling by on their bikes yelling, "Hi Jack!! Hi Jack!! Can you play later?!!" and waving furiously. Skeptical, thinking were getting a "hard sell" on location location location and neighbors neighbor neighbors, we moved in anyway. Wouldn't you know it, Jack wasn't fibbing. When we 1st moved in here, the neighbors were all really nice, and we did have potlucks most every Sunday for a few years, and the kids went by on their bikes waving hello, the neighbors always stopped to chat when walking their dogs, and on some weekends, the kids would have a lemonade stand to raise money for the pets at the Human Assn. It was like we moved to Mayberry, and it was perpetually a cool summer day when everything is right with the world. Then, things started to unravel. Some neighbors had to move out of state for a job, some neighbors moved to make room for an in-home business, some neighbors fell into financial problems and had to downsize and move, some neighbors got divorced, and some neighbors got very sick and died. As the neighbors came and went, the grill stopped hearing the laughter, conversation, and life on Sundays. The grill went silent, and the new neighbors never got to see the grill in its full splendor. Last year, the 1944 old stone home was purchased and fully gutted for the soon to be wedded new neighbors. Everyone is different now. The new 1944 stone home owners did not get to pet the neighborhood dogs, did not hear the laughter, did not wave to the kids on bikes, and did not participate in conversations to solve the worlds problems that the grill has witnessed. They just saw a broken brick grill standing in the way of putting a fence up. 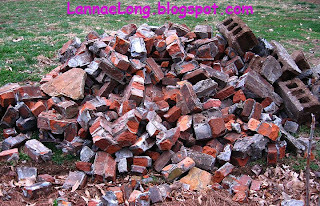 So, last week, the brick grill was brought to the ground and is now a pile of rubble awaiting removal to the land fill. 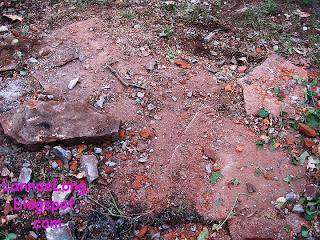 This is all that is left where the neighborhood grill once stood. All that is left are my memories of my old neighbors, delicious potluck food on the grill, the kids running around with the dogs, and great chatter about what we were going to make for the next week's pot luck. Al-Rasoul is a little place off of Nolensville Rd, behind the Gorilla Garage and Green Auto Sales, and is across the side street from the UHaul. The side street is just a few blocks south of the Aldi's shopping plaza and the zoo entrance, but north of Harding Pike. You cannot see Al-Rasoul from Nolensville Rd, only from Elysian Fields Rd. Do not be confused, there is an Elysian Fields CT, but that swoops around to connect with Elysian Fields Rd. There is only a small red sign with yellow Arabic writing on it in front of Al-Rasoul. If you google this place, you can type in USA Bakery with the address and see the street view. What I am trying to say is that this place is delicious and hard to describe how to get there. Years ago, we were tipped off by my foodie co-worker that there is a wonderful Persian flat bread maker behind the Gorilla Garage. She did not know the name of the bakery, and the only thing we had to go on was the Gorilla Garage. Later, after some searching on Google, we determined the name of the flat bread bakery is USA Bakery. We made it to this location, and we saw the wonderful bakery in the back. The brick ovens look like a really big old style top-loading washing machine. The flat bread is made by stretching dough balls out into big round disks, like a nice pizza disk. The disk is slapped into the oven hole onto the wall of the oven, and the cover is closed. When the bread is done baking, they bread is lifted off the wall, and packaged up 4 for $2. The bread has a lovely wood oven flavor, and can be eaten as is, eaten with some delicious food from Al-Rasoul, or made into the base of a pizza at home. Whole wheat and white flat breads are available. We have tried both, and both are delicious! The USA Bakery is in the back of the building. In the center of the building is a small grocery market with some vegetables, cold case goods, dry goods, and some Halal labeled meats. The last visit, I picked up some Nabulsi cows milk cheese which is mozzarella like cheese made with mahlab and black caraway seeds. The mahlab is tough to find in the USA, but is a common spice used in the Persian Gulf region, and is the seed of a specific type of cherry. Nabulsi cheese is slightly aromatic with mahlab, offering an aroma and flavor reminding me of a nutmeg, or cinnamon that you would get in Skyline Chili. Nabulsi does melt when heated, but not as much or as oozy as mozzarella. There is also other types of white cheeses available here including feta. In the front of the building is the Al-Rasoul Restaurant. The hot food cafeteria line offers different meals of the day, with curried lamb and lamb kebobs as staples. There could be spice baked Cornish game hens, braised lamb shanks, and other Halal meat offerings, but the menu changes from day to day. There were a 6 variety of soups offered during my last visit, all looked great, but since I was taking food to-go, I had to pass on the deep red soups with luscious veggies peeking out from the vat because I did not want to risk spilling in my newly cleaned car. The rice they offer are white rice, and a rice pilaf that looks like the ancient recipe of the original Rice-a-Roni. The history of Rice-a-Roni was recounted on NPR and you can click on the link and hear about it. I opted for a $2 serving (a filled to the brim take-away container full!!) of the special pilaf made with aromatic spices, diced veggies, raisins, tiny pieces of vermicelli and rice. It is likely this rice was made with real chicken broth. The flavor of this rice is subtle, the way a rice pilaf should be. The lamb entrees looked great, but I was here for the lamb kebobs. They are only $1 per skewer. The kebob here is also known as kubideh in other restaurants in town. Al-Rasoul's kebob is ground lamb with spices, and the spiced lamb is patted onto a skewer and then grilled over very high flame. The kebobs are made to order, so you will have to wait until they are cooked right in front of you. In my humble opinion, these are the best kebob or kubideh made in Nashville. The charry goodness, the meat flavor, the spice flavor is a perfect combination here. To get a dinner platter, I believe it comes with 4 kebob, soup, tiny salad, bread and a big pile of rice for less than $8. Bring a tupperware to take food home because portions are enough for 2 - 3 people. OK, so I usually take-away from Al-Rasoul because I have something else planned for the the food. 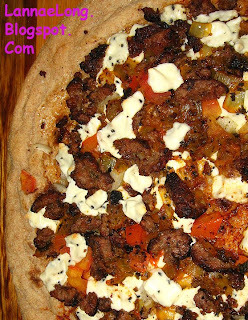 I make a Persian inspired pizza and here is how I do it with ingredients from USA Bakery and Al-Rasoul. Hint: since I do not have a pizza stone, I put the pizza on the bottom side of jelly roll pan (jelly roll pan upside down in the oven), so that it is easy to slide the pizza off the pan and onto the cutting board. I guess I should mention that the reviewer on Yelp (click on the address at the top of this post to connect with the Yelp review) has a point. This is an inexpensive lunch and early dinner place, and it closes about 8 pm or earlier if there are no more customers. This is a delicious place, but not a place to wow a 1st date with ambiance, but I would say it would WOW a first date in Persian style yummy food. The owners have really spiffed this place up over the years, and it looks a lot like a lot of other established meat and 3 restaurants in town. The building may be old and showing a lot of wear, but the tables are comfortable and clean. Every time I have been to Al-Rasoul, there have been mostly only men eating here, and a few families. In general, I am the only single woman eating here. I have seen single women grocery shopping in the store section, single women taking out the hot food to take home to for dinner, and I have seen the women bakers working, but in general, my observation in the dining room is similar to the Yelp review description - I am one of the few single women dining here. Is this different than any other restaurant in town, I don't think so. Most people go to dinner with a friend or family. I just happen to be one person who is used to dining out alone because of all the work travel I do, and am forced to dine out alone on many occasions. I am totally fine with being the only single woman eating here, or anywhere else when Matt, my friends or family aren't with me. Every single time I have been to Al-Rasoul, I have been treated with respectful, friendly, smiling and earnest service, kind of like Norm walking into Cheers. And the last time I visited, the young cashier let me have a honey cookie on the house! Deliciously Sweet!